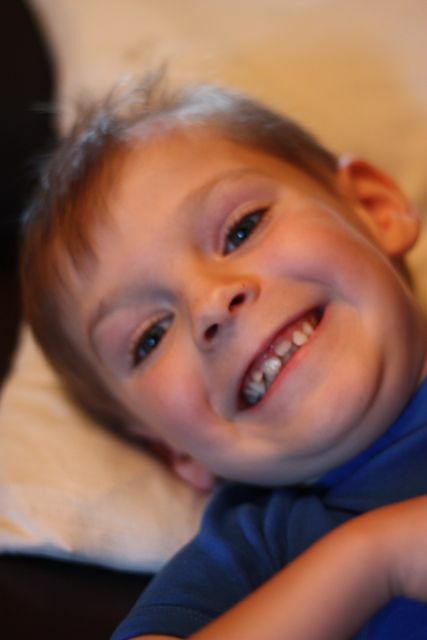 6 years ago today, my wonderful son entered the world and changed my life forever. Today we celebrate all that he is and all that he has overcome in his few short years on Earth. 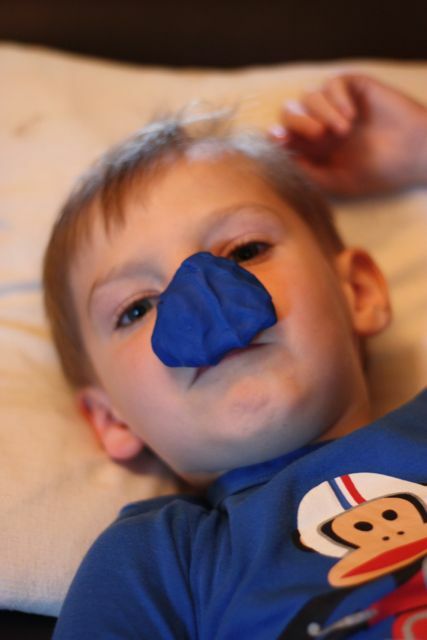 Despite the seemingly endless challenges he’s had to face, he remains an (almost) normal 6 year old. He’s active, unbearably sweet, stubborn and prone to tears. He loves LEGO and Star Wars and art and hockey. He’s immensely curious about the world around him and loves to learn and explore. He lives in the vast universe of his imagination, playing roles and creating stories. As much as I wish it weren’t so, in many other ways he isn’t that normal little boy. He is set apart by illness, and hospital and knowing too much and experiencing too much for one small child. Earlier this morning we had a discussion about the price point of generic vs. brand-name ondansetron. Today he is celebrating his birthday lying down on the couch and trying to avoid a trip to the ER. 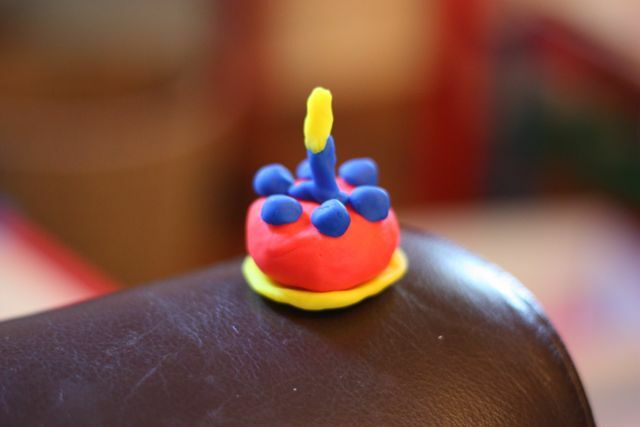 His only birthday cake today will be the little Play-Doh one he made this morning. He is putting a brave face on it, smiling for the camera, but he is heart-broken that his birthday must be spent this way, and that he’s missed not only the first but second day of school also. He was so, so excited to start Grade 1 yesterday. Too excited. I knew, dropping him off, that the chances were good he wouldn’t last long. He’d already had 3 days of headaches and vomiting at the cottage – but managed to enjoy his family birthday celebration all the same. He liked helping to frost his cake but couldn’t eat it. We returned home early from our annual Labour Day celebration in order for him to get enough rest for the first day of school. He set his new Yoda alarm clock so that he wouldn’t sleep in. Yesterday, he clutched my hand as he streamed into the school with the big kids for the first time. He high-fived his teacher with confidence, and I left, hopeful. Sunny late summer days seem full of promise, and I ran a few errands on Roncy, revelling in being alone for the first time in ages. I happened to glance at my phone as I set off to retrieve a couple of Bean’s birthday presents, and noticed sadly the missed call, voicemail, and texts. Sighing, I jumped in the car and headed straight to the school, getting there in time to hold the bin for Gavin to vomit into. It had been 45 minutes. Upon arriving home, he proceeded to barf 12 more times throughout the day. His meds had no effect and hydration seemed impossible. I debated with myself whether to just pack him in the car and go, but he wasn’t as poorly off as he has been in the past, and by evening managed to hold a small amount of liquid and slept. He has continued unwell all day but seems to be making moves in the right direction. Which means I won’t have to get him an IV for his birthday. And he may be able to attend school tomorrow. He is just dying to get some homework! Still, I am worriedly musing about how to tackle this next. Last week we had some news – not unexpected, but upsetting all the same. Gav had his annual-ish kidney ultrasound and meeting with nephrology. In the grand scheme of kidney disease, we (as in the doctor and me) aren’t too worried. The doctor who examined him explained that, by the parameters that they judge kidney health, Gavin’s is generally good – or at the very least, acceptable. We have known for some time that the chemo he received damaged his kidneys – but we were happy that his hypertension has resolved without the need for further medication. However, on the ultrasound last week, his kidneys did not appear “normal.” They look like kidneys that have taken too many hits. The issue being that every time he has a vomiting episode, he becomes severely dehydrated and his kidneys take another knock. The only ways to protect them are to: keep him hydrated, and avoid medications which are toxic to his kidneys. Unfortunately, I hadn’t realized how hard ibuprofen is on kidney health, or if I had, I’d forgotten it. We have been giving Gavin Advil fairly frequently for headaches of late, but will no longer be doing so. The hydration is a more difficult issue. He’s now having episodes every 7 days to 2 weeks. He doesn’t become severely dehydrated every time, but there is a certain general depletion that goes along with vomiting so frequently. So… what to do next? It sometimes seems that there is not much we can do, but I’m still relentlessly researching, adding in new supplements, trying new medications, routines and any kind of snake oil I read about on the Internet. The birthday boy is now putting together a new LEGO set from his Uncle Ryan. He still has a birthday party with his buddies to look forward to on the weekend, and judging by the fact that he is so poorly today, he should be fine by then. Silver linings. We have to celebrate everything in stages, knowing that if we take several goes at it, we’ll hit the target sooner or later. Perhaps he’ll even enjoy a piece of cake! Congratulations and all the best for the future! sending you all an incredible amount of love, always. Happy birthday, sweet dude!